With so many satisfied customers, it’s no surprise that 5 Star Auto Glass was voted by Expertise as one of the top auto glass companies serving Alexandria, VA, in 2018. Our mission has always been simple – quality work, get the details right and do it at a competitive cost. Whether you’re in need of our mobile service to your residence off Duke Street, or to your workplace in Old Town, we can have your replacement completed on site at no additional charge! Answer: Typically when owners see water inside of their vehicle, their first reaction is to suspect the windshield. However, water intrusion can come from a number of sources. The location and characteristics of a leak will give us clues as to the possible source(s). The signs you’re describing are commonly seen in sunroof leaks. If the openings to a sunroof’s drainage system become clogged, water will overflow and begin leaking into the cabin. Check out our article about water intrusion sources on our blog (coming soon). Many vehicles come equipped with a rain sensor as a standard feature, or as a part of a trim/package upgrade. When engaged, it will activate the windshield’s wipers automatically. Many will even change speeds to adjust for changes in rain intensity. 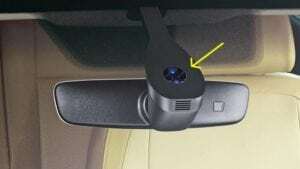 While there are many styles, most rain sensors, with the exception of Toyota/Lexus and others, will be located directly behind the rear view mirror, as shown in the example below. “5 Star Auto Glass is a exactly what a small business should be. Brian was a pleasure to work with, provided excellent customer service to me, and clearly takes great pride in his high quality work.